It is one of the most famous district in Tokyo. There are shops, restaurants, skyscraper, also known as the center of transportation. Convenient place to go other tourist areas as well. Just 3 min walk from Shinjuku South Exit. Convenient high-rise hotel. 9 min walk from Shinjuku West Exit. Traditional luxury hotel facing Shinjuku Central Park. The newly-opened hotel in April 2015 which is only 5 min walk from Shinjuku East Exit. The hotel set up a designated international guest counter. A budget hotel located only 3 min walk from Shinjuku West Exit. A 5 min walk from Shinjuku Station. Convenient hotel which is right next to the lively Kabukicho area. A chic business hotel in Shinjuku district, 3 min walk from Shinjuku South Exit. A comfortable hotel with a taste of Kyushu which is opened in August, 2014. Meet the world famous character "HELLO KITTY"! It's a perfect package for a day trip from Tokyo! Sanrio Puroland is an indoor theme park in Tama city of Tokyo. You can go by Odakyu line just for 35 min from Shinjuku station without any transfers. It's a weatherproof indoor theme park which can be enjoyed even on rainy days from small children to adults. This tour includes a Sanrio Puroland Passport and return discount train ticket from Shinjuku. Sanrio Puroland is an indoor theme park in Tama city of Tokyo. You can go by Odakyu line just for 35 min from Shinjuku station without any transfers and meet world famous characters like "HELLO KITTY". "Odakyu Sanrio Puroland Tour" available at Odakyu Sightseeing Service Center, Shinjuku West! TOKYO SKYTREE TOWN opened in 2012. You can enjoy the superb view from the world's tallest tower and also shopping at TOKYO Solamachi℠, shopping complex at the foot of the TOKYO SKYTREE℠. Since its opening, it is one of the most visited entertainment spots in Tokyo among foreign guests. Try this unique entertainment show in Kabukicho district. 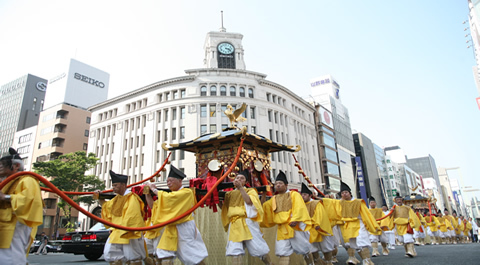 Asakusa is one of most famous tourist attractions in Japan. Walk through the red Kaminari-mon (Thumder Gate) and enjoy a stroll in Nakamise-dori (shopping street). The world's largest fish market. There are 2 sections of an inner market for the wholesale business and an outer market for retail shops and restaurants cater to the public. From 2018, 11th October inner market is moved to Toyosu area. An outer market is still remain at Tsukiji area. In Edo-Tokyo Museum, showcasting original objects and replicas you can find the history of Tokyo.. Multi-language touchscreen displays including English and a free audio guide are available. One of the major department stores in Shinjuku. You can always find worldwide brands and tredy items. Shinjuku Gyoen is one of Tokyo's largest park with 58.3 hectares of gardens. It has great collection of flowers for all seasons. Shibuya is the center of the teen culture. It's famous for its scramble crossing and a place where youth fashion and trends are born. It's one of the most famous shrine in Japan. Try an omikuji (paper fortune) and if you are lucky, you can see a traditional Japanese wedding. Shinjuku is the center of Tokyo with an office town with many skyscrapers such as the Tokyo Metropolitan Government office and many other business facilities. Moreover, a few minutes’ walk from Shinjuku Station is the Japan's famous entertainment district of Kabukicho. "Odakyu Sightseeing Service Center, Shinjuku West" is located in Shinjuku station which is ranked the world's busiest station with the number of passengers. English and Chinese speaking staff are available every day and provide various convenient service to foreign travelers. You can not only get transport and sightseeing information within Tokyo and along Odakyu line but also book day tours and Ryokan & Hotels. If you book a travel package through this website, you can pick up tour tickets here at the voucher exchange counter. Besides, Baggage Storage and Delivery Service as well as Currency Exchange are available. ※Baggage Delivery and Storage service is open until 21:00. ※English and Chinese are available every day and other languages are depending on the day. You can reserve day tours to Hakone or Tokyo and if you want to experience Japanese culture, we reserve Ryokan or Hotel stay in Hakone and Izu Peninsula. Accommodation packages including round-trip Romancecar tickets and same-day hotel bookings are available, too! We sell various transportation tickets including Odakyu line normal train ticket, Romancecar limited express ticket, Hakone Freepass, etc. This is an exchange counter for the tickets that are purchased in advance. You can exchange your tour tickets with voucher. ※Please be adviced it may sometimes get crowded and take time to exchange. If you are taking Romancecar train, please come by 30 minutes before the departure time at the latest. You can find not only the transportation and sightseeing Information along Odakyu line (Hakone, Kamakura, Enoshima and Oyama) but also the information of Tokyo and Tokyo suburbs. You can temporarily deposit baggage such as suitcase or souvenir that are too big to fit into coin-operated lockers. We also send your baggage to Haneda/Narita airport or hotels. Please enjoy hands-free sightseeing and travel lightly. 33 different foreign currency exchange available at Shinjuku station. You can stop by before going to a hakone trip or during your stay in Shinjuku. ※English and Chinese are available every day. You can temporarily deposit baggage such as suitcase or souvenir that are too big to fit into coin-operated lockers. Please enjoy hands-free sightseeing and travel lightly. ※Baggage Delivery is not availiable at Shinjuku South.